How to Make Vegan Ground Beef in under 30 min! Meat Free. Seriously, I promise you that’s not a bowl of beef staring at you, calling out eat me, eat me now! This meatless, very vegan ground ‘beef’ recipe is a savory masterpiece packed with an umami punch. By using a combination of fresh brown cremini (or Portabellini) mushrooms for texture, and an optional sprinkling of dried mushrooms to boost your savory umami fix, it’s got that traditional ground beef experience that’ll hit you right in the tastebuds. The basic recipe is extremely versatile. Adjust it by adding a few extra fresh herbs or spices and you can transform this humbly delicious staple into a spicy variation for your fave cuisine. This meaty but meatless vegan ground beef even works wonders as a quick snack on toast for lunch or breakfast. While a few ingredients here are optional but strongly recommended, there are a few you cannot do with out. 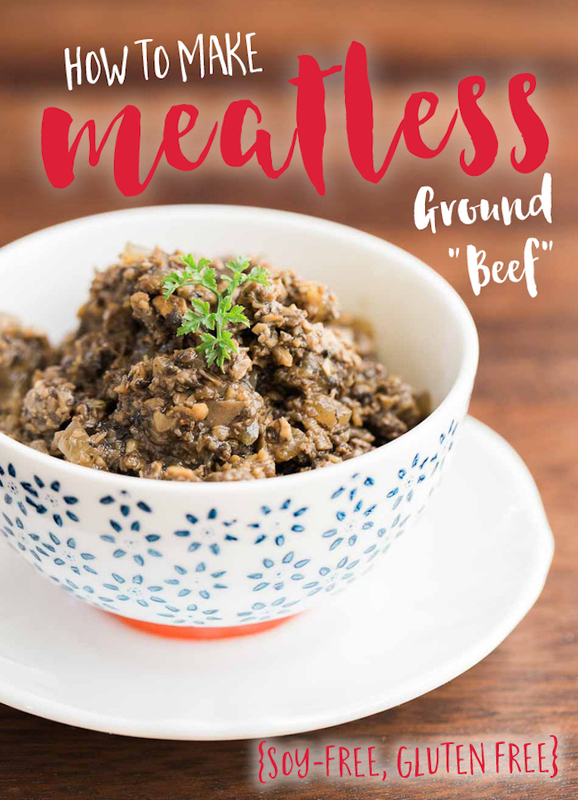 To create a bare bones version of this deliciously meatless vegan ground beef you absolutely need to use brown cremini or Portabellini (baby portabello) mushrooms, Rosemary, onion and the freshest flat Italian parsley you can get your hands on. The vegan Worcestershire sauce adds an additional rich dose of flavor, and also adds to the dark brown color associated with beef. This delicious, umami-packed ground beef replacement is soy and gluten free. It can be made in minutes and used with anything from pasta to pie to pizza! If using dried mushrooms, pre soak in warm water as per instructions on package. Keep liquid for use later. Place the fresh mushrooms into food processor or multi chopper until mushrooms pieces are "minced"
Finely chop onion. Using the multi chopper saves loads of time.